There's been some chatter on the interwebs recently about the original single-application functionality of Mac OS X being still hidden inside the operating system, and easy to enable with a simple Terminal command. Guess what? All those people who originally “widely reviled” the “feature”? They were right! The most important fact to realize is that single-application mode is tied exclusively to the Dock. This means that if you click an application's icon in the Dock, it immediately hides all the other applications, including the Finder. In this screenshot, you can clearly see the behavior in effect. I'm using a 2D Dock and a small hack to make hidden applications less opaque so they're immediately identifiable. 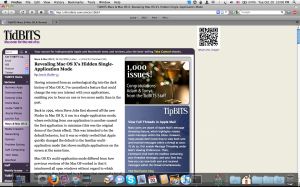 When I clicked the Firefox icon, all of my applications hid themselves. That would be great, but for the fact that if I try to hide Firefox too, guess what happens? Nothing. And nothing is a problem. For starters, it leaves me scratching my head, wondering why I can't hide this application. Then, once it dawns on me that OS X for some unknown reason restricts you from hiding all of your open applications at the same time, it leaves me scratching my head again. During normal use of OS X, you'd almost never notice this little bug. That's because I can think of exactly nobody who would try to press Command+H while Finder is focused. But with single-application mode, it becomes readily apparent, and worse, impedes your workflow until you can figure out why that doesn't work. However, if you switch applications through any other method, including clicking another visible application's window and the Command-Tab application switcher, Mac OS X's normal multi-application approach remains in effect, and nothing will be hidden. You can thus combine methods of switching between applications. Click Mail in the Dock, then use Command-Tab to switch to Safari, and you'll end up with both Mail and Safari on screen, and nothing else. If you later want to hide Safari again, click Mail's Dock icon (or just Option-click on Mail's window). So, let me get this straight: This will sometimes work, sometimes confuse me, but always require me to think about how the windows and applications I'm using are arranged, so that I can be more productive? Thanks, but no thanks. 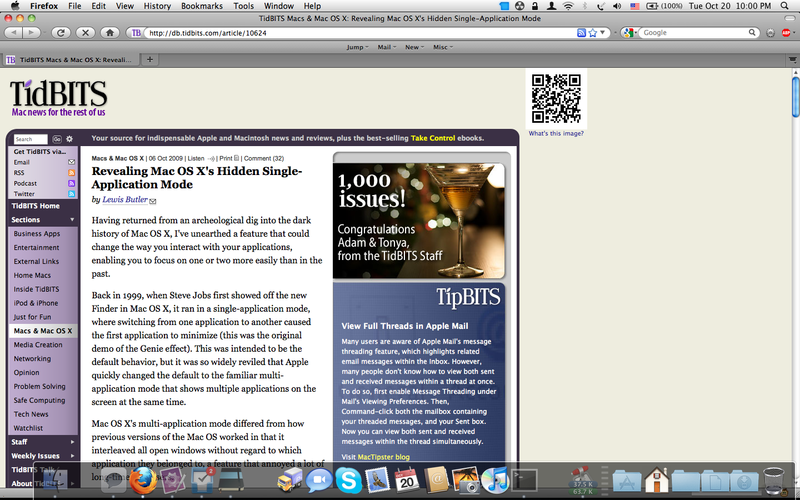 In short my friends, you don't need Mac OS X's single-application mode.